A year ago next week, Ryan picked up a set of keys for what would become the new BlueCat Motors. Moving from our old Vandalia location to our new shop on Prior Ave. has brought with it new freedoms, new challenges and lots and lots of change. Yet the more things have changed, the more BlueCat Motors has come into its own. We’ve found focus. We’ve made new friends. We’ve grown our ranks. We’re building something we’re really proud of. Making the move into our Prior Ave. location was a lot more than a change of address. It meant a lot of trade-offs. The autonomy of building ownership brings with it the hassle of building maintenance. Our higher profile location has made us much easier to find. It also put us on the city’s radar. Building inspections and city ordinances meant what seemed like a bread line of officials to please, each with their own demands for action, fees or both. Getting the building up to code took a lot of work, a lot of cash, and basically a solid year of Ryan’s time. Building a business is hard work, and you can’t count on anyone but your crew and your best customers. About the time we made the move to our new location, we also made a choice of focus. 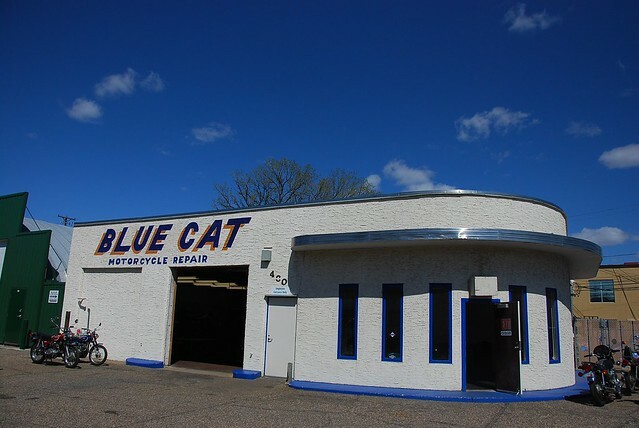 In a lot of peoples’ minds, BlueCat Motors was “the place that’d work on anything.” For others, we were the Twin Cities’ “other scooter shop.” We’d been servicing all manner of motorcycles, scooters and mopeds — just like we do now. We were also a scooter dealership, carrying the area’s only inventory of new SYM scooters. A variety of factors got us out of the new scooter business, but it was all for the best. It made the most sense to focus on service. Soon after, we focused even more narrowly as we made the decision to stop servicing Chinese scooters. They’re almost all junk to begin with, and between parts quality and availability, it meant we couldn’t give people the kind of service they deserve. So now we’re focused. We work on bikes. Period. 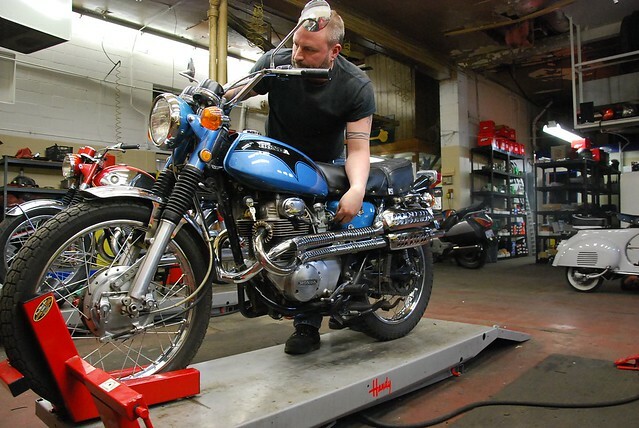 We specialize in vintage Japanese and European motorcycles, but we work on modern metric bikes as well — including metric v-twins. We still service non-Chinese scooters from Taiwan, Japan and Italy. We also customize and restore everything in between. We don’t service American bikes, we don’t work on Goldwings, and sorry, you’ll have to take that early Virago somewhere else. The reasons are varied, but it’s the best way forward for us and our customers. This year on our own has also meant saying goodbye and saying hello. Our parts man extraordinaire, Andrew, left us to serve his country. Jake is now the TC’s best muffler man. Ryan lost his best friend of 19 years to cancer. For all we’ve lost, we’ve also gained. 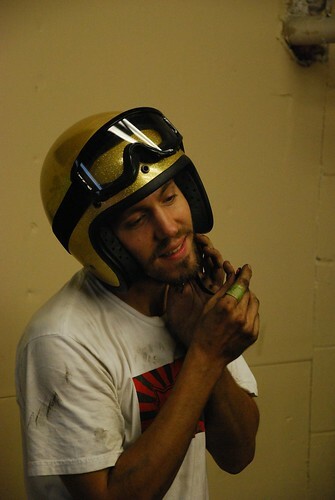 We added Robb, a guerilla mechanic if ever there was one — the master of tools and whisperer of engines. 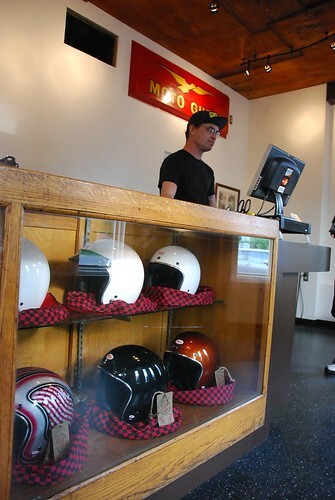 Our man Mutt joined us to man the front desk, keeping service info straight, parts on the way, and customers in the loop. 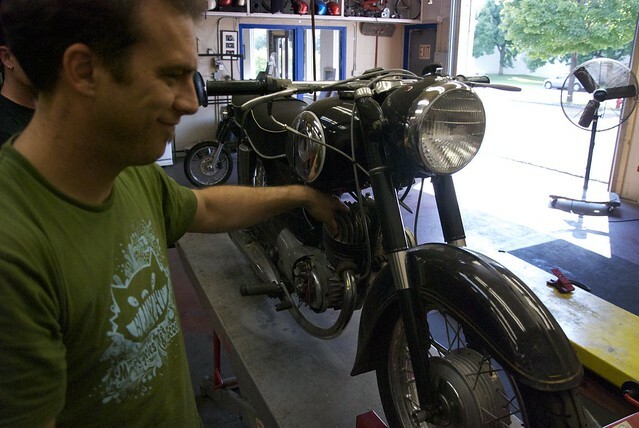 Rumpal came back to us after a winter away, and we’re thrilled to have him working on bikes again. Jeff is steering the service ship when he’s not elbow deep in a tough fix. Ryan has been focused on the building all year, not just making the city happy, but working with our friends The Rust Brothers to get the front lobby sorted out. Support people like myself, Reid, CT, Casey, Steve and others keep the good word on the street. Having our own place has made a lot of good work possible. It’s easier for our customers to find us. It’s helped us make new friends, who have in turn helped us build our business. Looking back on the year, we’ve had some really good times. We’ve fixed a lot of interesting bikes. We restored some classic machines. We brought many an engine back from the dead. We’ve made friends in the neighborhood and friends in the motorcycle community. We’ve thrown some fun times at Third Thursday, and we’re just getting started. We’re going to throw more and more events in the future. We’re going to keep having a good time. We’re going to keep fixing bikes and building custom machines. The more things change, the more they stay the same.